“I forgive my enemies and I ask for justice; I put up my hand and call for a great peace and a great national dialogue,” President Maduro said. June 7 (teleSUR) Venezuela’s President Nicolas Maduro has renewed his call for national dialogue with opposition sectors, urging them to consolidate peace in the face of violent acts intended to destabilize the country. “In the face of violent plans I invoke peace and I say to them, to everyone: if anything is worth the word of a revolutionary son of Chavez, I forgive you and I call you to make a vow for peace, to abandon the path of conspiracy, of interventionism. I cry for peace, I fight for peace,” Maduro said. 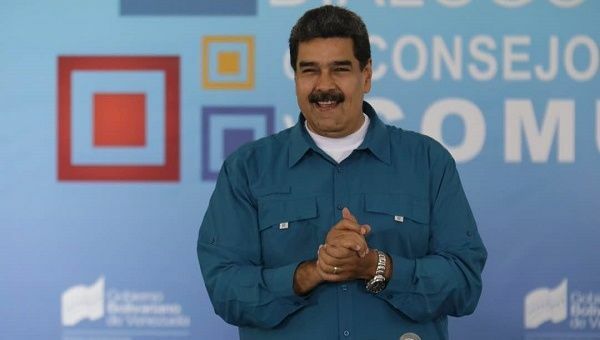 Addressing a meeting of communes in Miraflores Palace, Caracas, Maduro referenced the recent release of opposition politicians and activists awaiting trial in connection with violent acts that killed nearly 200 people between 2014 and 2017. Almost 80 people have so far been released by the Venezuelan government as part of the ongoing process of dialogue and national reconciliation. In the next few days, fresh procedural benefits will be granted to those involved, Maduro said. Maduro also rejected ongoing U.S. interference via the Organization of American States (OAS) and said U.S. Vice-President Mike Pence, who failed in a bid to pressure members to approve Venezuela’s expulsion, had been defeated.